Good functional and sturdy product, I highly recommend it. Sturdy, user-friendly and stays put on the windscreen! I have an unusually wide protective phone cover. I was anxious that the holder would be able to hold it. Absolutely no problem . Would have liked the flexable arm to be a little longer. The arm is a little too short. Super useful, easy to set up, getting one for my mum too. Very useful bit of kit, not expensive either. If you use your phone as a sat nav its much safer than having it moving about on your dashboard or lap or whatever you do. The fact that you can move it about means you can get it right in your eyeline, which is much safer. Use it all the time with my iPhone. I would definitely recommend this product. 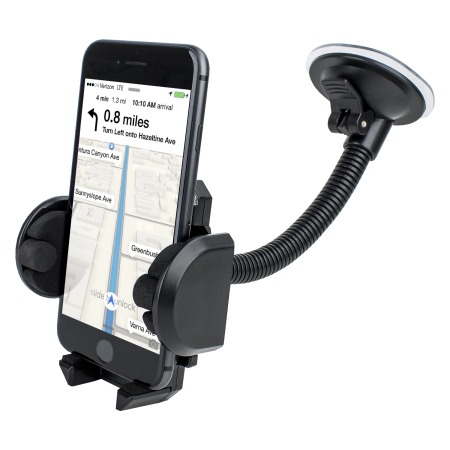 Hi I bought smartphone car holder for mobile fun.com. The product came to my house super fast. And its a very good quality.i am so happy and I recommend this 100.10% thanku fun mobile. Very sturdy and so far so good. The flexible arm allows me to change the position especially if the sun shines on my phone screen. Good value for money. It is exactly what I was looking for, a simple, compact holder for an iPhone. It does exactly what it says on the box. It is what I was looking for and very competitively priced. the phone holder shakes too much, making it hard to read the map the properly. Compared to other holders I have tried the suction cup on this one is very strong so its unlikely to fail when you adjust it. Also the width of the clamp allows the phone with a bulky case to be placed into the holder. I haven’t opened it as it’s a Christmas present.however the packaging on the outside looked perfect ???????????? My husband has a similar one which is really good, so I was looking for one like it. It is just what I wanted. I am very satisfied. Reallly pleased. Easy to use n holds phone perfect. How well it holds the phone. I bought this as a replacement for a more rigid holder that broke. The swan neck is useful and the adjustable phone grip works well. However, most phones will extend a fair way over the top of the holder. This, in itself, isn't a problem but the grips don't hold it firmly enough to stop the phone tilting within the grips when tapping the top half of the phone (e.g. when using a sat nav app on the phone). On the plus side, the description makes no mention of the removable clear plastic cover that sits behind the phone. You can put a picture of your family/dog etc in there for when it's not holding your phone! I'm using the holder to contain my smartphone which has the app WAZE on it to be used as a sat nav. Excellent! the vibration was a bit of a nuisance but easily remedied. Excellent item easy to attach and detach. Great little gadget,now I have somewhere to store my phone. It's strong and secure. Detailed description of item along with return policy if unsuitable plus delivery details and cost. It does exactly what I wanted it to ... securely hold my mobile in a convenient place. Well built. Sturdy holder with a good, long arm that’s not wobbly. Can be adjusted to any angle. I brought this as the one that was given to me snapped, and this is absolutely perfect, I can move it around to a position that suits me, it has a great grip on my phone and beats anything in the shops in my opinion, I would recommend this to everyone as I think it’s the best. And such a bargain for your money. This really is a great phone holder. Great value for money, very pleased indeed. The device doesn't allow a landscape view of my phone and is not secure in the portrait position. If you have a larger phone this device doesn't work. Great product, exactly what I was expecting. This product works exactly as described. Nothing but there are no instructions on how to install it. didnt like it at all too much movement on it, is big and bulky on your window screen would not recommend. Sorry to hear it broke on first use. Could you please contact our Customer Services team so we can look into this for you. sticks well to the windscreen - great suction. Simple to put together and install in car, easily moved or removed. Easy to put phone in and out of it. Very suitable for using phone as a sat nav. Good product and quick delivery. Would recommend. Easy to install, very stable. Perfect product. Does the job pretty well, only negative is that it turns too easily and would prefer that it could be locked in horizontal or vertical position! Nothing, the product was pretty well described! i was so pleased ibought a 2nd one many thanks roger. Bought this as needed a universal holder as we share our car. It wobbles when driving which doesn’t help my vertigo!!! It does what it is meant to do and does lt well. I wish I’d bought this ages ago. I have tried various devices and none have worked reliably. This holder really does the job. Highly recommended. I have an iPhone 7 and although the phone is fine in portrait it is not tall enough to properly support it and can topple out of the holder. Might be a good idea to give height of phone limits. However, well constructed and easy to use. I already heard you were good.now I now will visit you soon. nokia 8 and sony aqua m4. Holds the android phone well and is sturdy. Great quality gadget. Arrived on time. Easy website to use. Does what it says on the tin. Not flimsy good product. Bought this holder a few weeks ago for business and I am extremely pleased with it. Very good value and quality made. Great does as it says holds the phone ???? Once assembled correctly it seems quite sturdy. It has been stuck on the windscreen for over a month and has not fallen off. Easy to put phone in (mine is in a skin type case) and can be charged at the same time (charging port at the bottom). There is some vibration, which is a minor irritation, though can be remedied by resting the bottom of the holder on the dash. Can be rotated between landscape and portrait though you need to lock the little latch at the back and this is a bit fiddly. Overall does the job well and have bought a second for the wife. Phone sits nicely in the holder but the actually holder connecting to the extension comes off easily especially driving on bumpy roads. Fixed this with blue tac and tape to stop it coming off and it is fine now. Video on the webite should show how to attach the two pieces just in case I have been doing something wrong. Useful as an alternative for the car but haven't yet worked out how to attach actual phone holder to stalk that fits to screen so that it fixes properly. Sturdy and sticks well with good gooseneck and very expandable holder.The one small point is that the removable plate which attaches the phone holder to the cradle unattaches a bit too easily if you try to alter the phone angle. I might glue it. I bought this for my wife after she got booked for using her phone. It is a great and easy to use but the lugs at the bottom that hold the phone broke off after about 6 weeks. So I am about to buy another phone holder but it certainly wont be this one. This smart phone holder is chunky and unstable. Disappointed with the quality. I like the product in general, it does what it says on the tin. However, where the neck and the phone holder attach, there is nothing to lock it in place. The result of this being that as soon as you go over any road surfaces that are slightly bumpy, the holder falls off. I have had to superglue the holder to the neck in order to stop this happening. Seems a sturdy product. Brought for Mum so cant review the usage. I bought one for my daughter for Christmas and she raved about it so much I treated myself to one. Its the first holder that doesn't bounce when traveling. The cradle the phone sits in is so easy to adjust, and feels safe. 100% satisfied. Sooo frustrating!! Phone cradle bounces off holder! This is probably user error but I couldn’t find a way to secure the phone cradle to the goose neck holder as it only seems to “slot on” to it. As soon as I hit a pothole (numerous in Scotland) the whole cradle inc my phone bounces off and lands on the windscreen wiper indicator!! Sooo infuriating and I know it’s going to break my phone screen in the near future. What am I doing wrong? We are sorry you have had a bit of trouble with the cradle you have purchased from us, Here's a bit of our advice: Once you line up and insert the 4 connectors you need to push the mounting plate until you hear a click. It takes a little bit of force but there's no way it will come free afterward. Hope this helps! If not contact our Customer Services for further support. just the job does what it says on the tin. Prompt delivery. Suction cup of poor quality. The plastic suction cup appears to be not of good quality as it cannot withstand heat within the car; it has distorted in the sun, which makes the holder unstable and bounce. The rest of the product is good. A bit stiff at first but persist and it will bend and eventually stay where it's meant too!